Derby hold a slender advantage after the first leg of their play-off semi-final with Brighton. Jesse Lingard fired past Lee Grant from inside the box to put Brighton ahead after his first attempt was blocked. Chris Martin levelled from the spot after Matthew Upson fouled Craig Forsyth. Derby went in front just before half-time when Martin's strike hit the crossbar and bounced in off the back of Brighton keeper Tomasz Kuszczak. Brighton came close to an equaliser but Grant tipped Leonardo Ulloa's shot on to the bar. It means Derby head into Sunday's second leg needing only to avoid defeat to make the Championship play-off final at Wembley on 24 May. Steve McClaren's side had already beaten Brighton twice this season and finished third in the Championship, 13 points ahead of their opponents who squeezed into the play-offs courtesy of Ulloa's last-minute winner at Nottingham Forest on the final day of the season. Despite Derby's tag as favourites heading into the game it was the Seagulls who struck first after a lively start at the Amex. Thursday's victory means Derby have won all three meetings with Brighton this season. Chris Martin scored twice as the Rams came from a goal down to win 2-1 at the Amex Stadium on 10 August. Patrick Bamford's 76th-minute goal gave Derby a 1-0 home win on 18 January. After having two early penalty appeals turned down, Brighton took a 19th-minute lead and it was Lingard, on loan from Manchester United, who broke the deadlock with a smart finish. Inigo Calderon, on the right, found space after a delightful back-heel from Will Buckley and his pass to Lingard was blasted home at the second attempt. 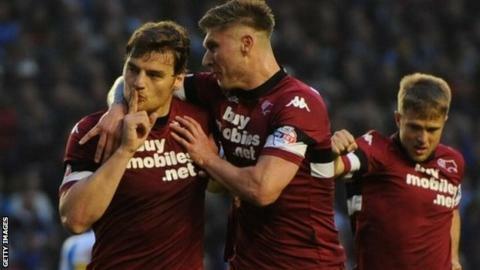 Brighton's lead lasted just 11 minutes, with the home crowd stunned into silence after Derby levelled from the spot. Derby, who had looked dangerous on the break throughout, broke from their own half and the ball eventually found its way to Forsyth who was scythed down by Brighton central defender Upson. Martin coolly slotted his penalty home - sending Kuszczak the wrong way for his 21st goal of the season - but there was worse to come for the hosts on the stroke of half-time. After chances for both sides it was McClaren's side who went into the break in front with Martin's strike from the edge of the box striking the crossbar and hitting the back of Kuszczak before bouncing in. It was a cruel goal to concede and harsh on Brighton who searched in vain for an equaliser. Derby continued to look dangerous on the break after half-time but it was Brighton who came closest to scoring next. A ball into the box eventually found itself to Ulloa who managed to get off a shot in the box but Grant superbly tipped the effort onto the bar. Brighton dominated the closing stages and twice came close to levelling. First Lingard saw his effort from the edge of the box saved by Grant who followed that up with another fingertip save from Stephen Ward who unleashed a fierce 20-yard drive. Brighton pressed for an equaliser but it never came and Oscar Garcia's side will now have to beat Derby for the first time this season if they are to have any chance of advancing to Wembley to set up a fixture against either QPR or Wigan who play on Friday. "It was a totally unfair result. We were better than them in all areas. I am really proud of our performance. "If the ref had given us an early penalty it would have been a better start. And in the second half we should have had a penalty but we need to improve in front of goal. "We knew they had a good counter-attack but it is difficult to play against the third-best team in the league, and they are a very good side. "I am really happy with the performance and we did everything but score. We have to believe because we have to go there and get a result. If we don't we will still come away with our heads held high." "It had everything. You saw every side of Derby County tonight. They started well but we showed great character, got ahead and could have scored a couple more. "We allowed them to put too much pressure on us in the second half and we are indebted to our defending and our goalkeeper. You've got to be hard to beat and we were in the second half. "We can be better and we need to be better because this Brighton side can beat us away from home. The tie is still open and there is a long way to go. The next goal will be crucial." Match ends, Brighton and Hove Albion 1, Derby County 2. Second Half ends, Brighton and Hove Albion 1, Derby County 2. Attempt blocked. Kazenga Lua Lua (Brighton and Hove Albion) right footed shot from outside the box is blocked. Assisted by Keith Andrews. Substitution, Derby County. Will Hughes replaces Craig Bryson. Corner, Derby County. Conceded by Íñigo Calderón. Simon Dawkins (Derby County) wins a free kick on the right wing. Jake Forster-Caskey (Brighton and Hove Albion) is shown the yellow card for a bad foul. Attempt blocked. Leonardo Ulloa (Brighton and Hove Albion) header from very close range is blocked. Assisted by Solly March with a cross. Substitution, Brighton and Hove Albion. Craig Mackail-Smith replaces Jesse Lingard. Attempt saved. Stephen Ward (Brighton and Hove Albion) left footed shot from the left side of the box is saved in the top centre of the goal. Assisted by Kazenga Lua Lua. Attempt saved. Jesse Lingard (Brighton and Hove Albion) right footed shot from outside the box is saved in the centre of the goal. Assisted by Matthew Upson. Attempt missed. Jake Forster-Caskey (Brighton and Hove Albion) left footed shot from more than 35 yards is too high. Offside, Derby County. Craig Forsyth tries a through ball, but Craig Bryson is caught offside. Conor Sammon (Derby County) is shown the yellow card for a bad foul. Keith Andrews (Brighton and Hove Albion) wins a free kick in the defensive half.